I recently was given TWO boxes of fresh, beautiful peaches and I’ve been having fun making all sorts of stuff with them. 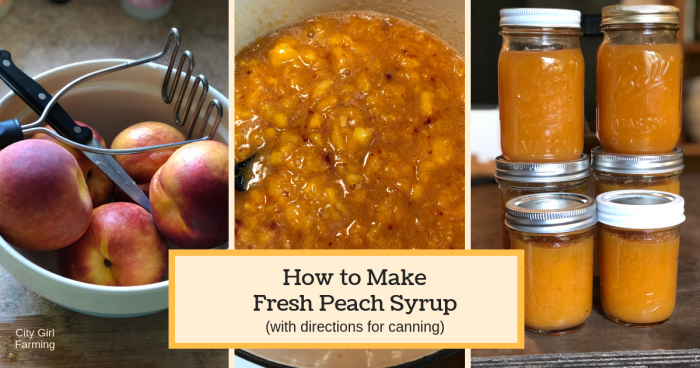 Would you like to learn how to make fresh peach syrup (and even can some if you want to)? It’s easy. And tastes like sweet, late summer sunshine in a jar. What’s better than that? Technically, this recipe starts out as a simple peach puree. I bring this up because you can do a TON of things with puree, not just make syrup. 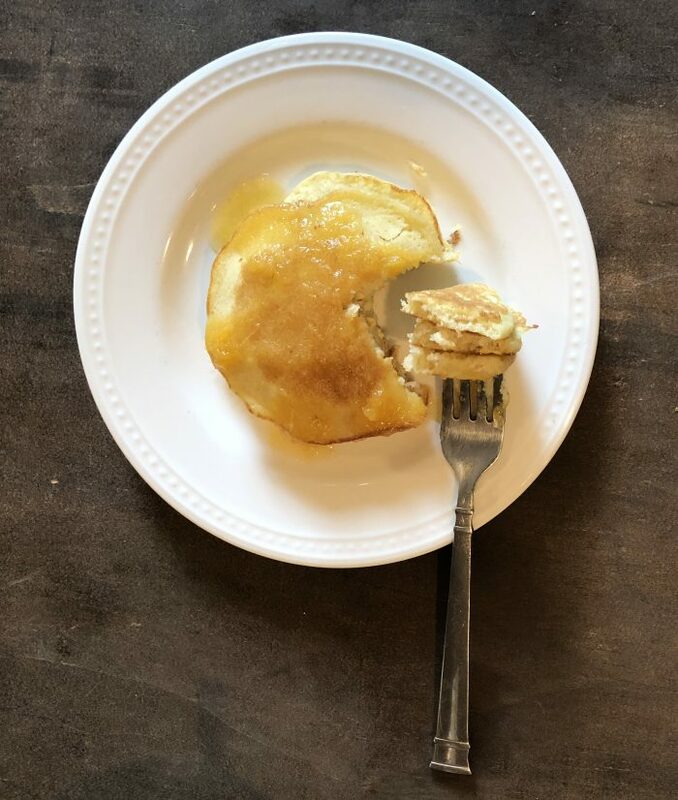 You can use the puree as is for your pancakes, but you can also thin it down to a more traditional ‘pancake syrup’ consistency. 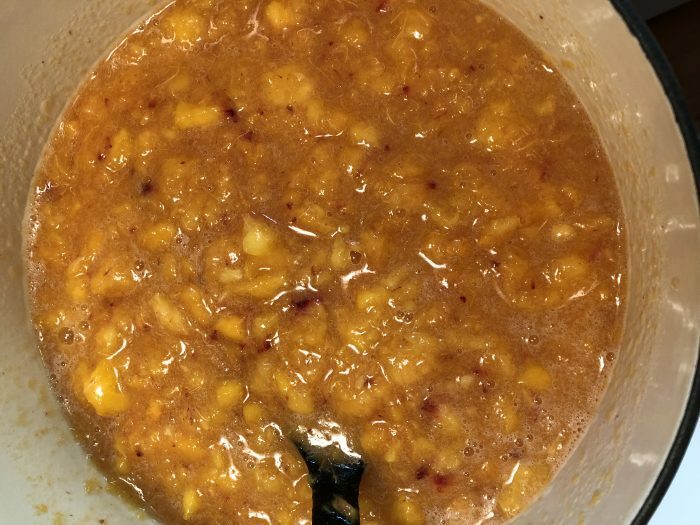 You can also use peach puree for a variety of other recipes as well. I’ll give you some links to more ideas at the bottom of this post. 4 tablespoons bottled lemon juice. That’s it. Yep. It’s true! 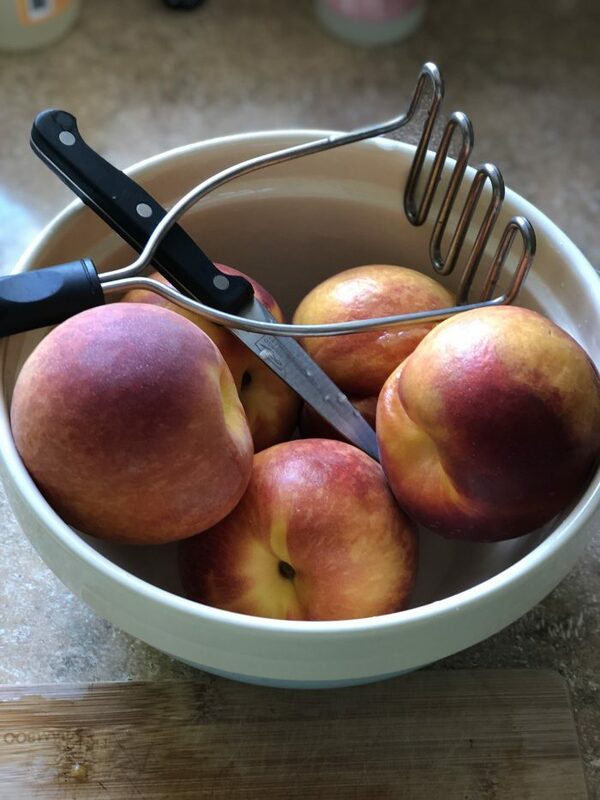 Peel and mash your peaches with a potato masher (I sometimes opt to keep them unpeeled and whiz them in the Vitamix…however, technically, you SHOULDN’T do that as it adds unwanted extra air in the mixture specifically if you want to CAN it when you’re done.) You’re looking for a kind of chunky mash as the end result. Add all the ingredients to a saucepan on cook on medium-high heat, stirring constantly until sugar is dissolved. Once the sugar is dissolved, turn the heat up to high. Keep stirring. Bring mixture to a full rolling boil. Reduce heat to simmer. Simmer for 5 minutes, stirring frequently. Remove from heat. Skim off foam. Technically, what you end up with is considered peach puree. This is a really foundational end product that you can use to make a ton of different things (as you will see below). Think of it as a staple (like chicken stock only different) where you can take it many different directions and end up with a lot of incredible, distinct creations. But what I started out telling you about is fresh peach syrup. Easy Peasy. If you like your syrup thick and peachy, it’s ready to use just like this. Otherwise, if you want to thin it down a little, use either water or maple syrup. Because I’m a total cinnamon freak, I ALWAYS add cinnamon to mine. And a splash of vanilla. (These are optional). If you like it smooth and NOT chunky, throw it into a blender to remove the chunks. Really, the point is, the peach puree is a starting point and from there, you can add your own personal touch. Then, pour it over your breakfast. It’s like liquid sunshine. A perfect cure for the winter blues. If you want other ideas for things to do with peach puree check the Monin website where you can grab recipes like grilled peach teriyaki shrimp skewers, peach BBQ baked beans, roasted bourbon peaches with smoked salt, peach BBQ sauce…and MORE…all using peach puree at its base (see, it really is like chicken stock, in its own peachy way). 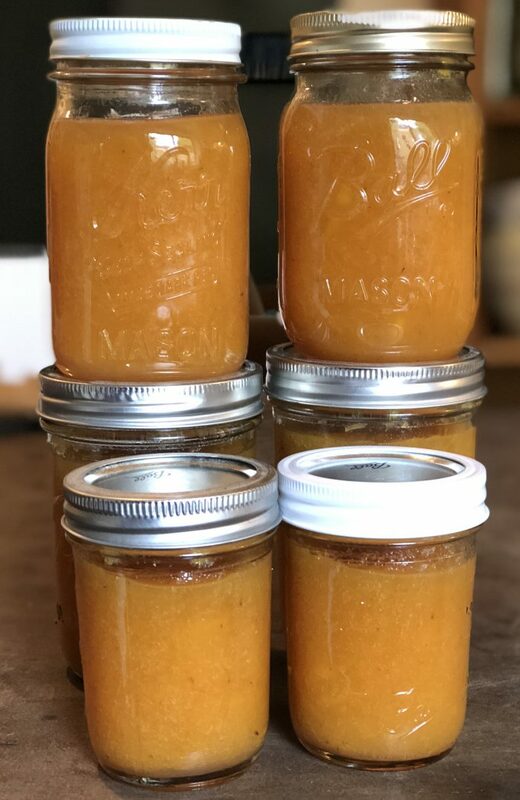 If you’d like to can the puree (before you alter it in any way from the original peach puree), use either half-pint or pint jars and process them using the water bath method for 20 minutes. 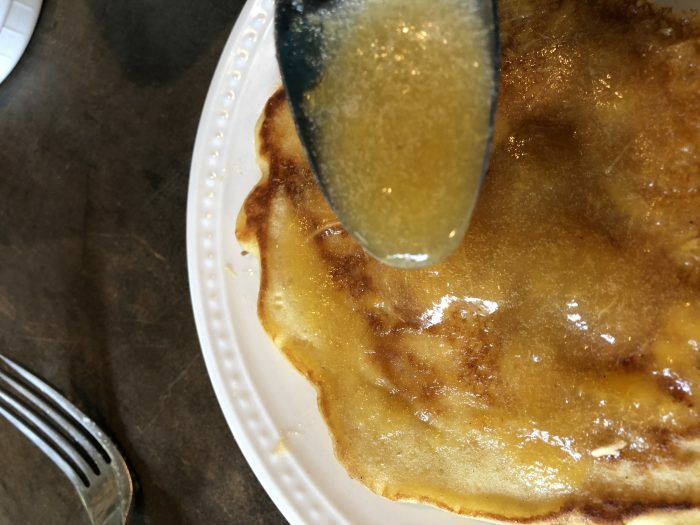 Think of this as concentrated peach syrup, that you can pull out all winter, add liquid to make it your desired consistency, and enjoy peachy freshness on your pancakes and waffles (or in a host of other things) all winter long!